Many soap makers like myself, find inspiration in many areas, including art, music, architecture and cake making. Recently, I was watching a YouTube video of a cake artist who decorates gorgeous, but complex cakes. They were done in what I would have considered a baroque style. What is baroque, you ask? Baroque refers to a style of European architecture, music, and art of the 17th and 18th centuries, characterized by ornate detail. The Palace of Versailles in France exemplifies baroque architecture. At a very basic level, to me, baroque means ornate and elaborate, with a depth of richness and unabashed decadence. In particular, the leafy flourishes the cake artist created caught my eye and in part inspired this soap I have created for Design Mania. 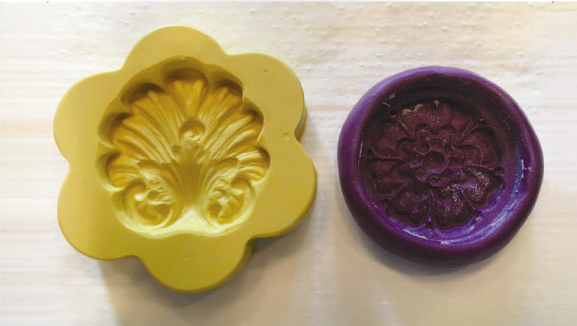 I used two techniques in creating this soap-using silicone molds to create embeds and using micas in an alternative way to color the soap.